Note: Click here for a Chinese language version of this review. The XGIMI Z6 Polar home theater projector—currently $570—is nothing if not versatile. It's a good fit as a budget home theater projector for less demanding users and equally good as a portable or small conference room or classroom projector. It's also a consumer electronics gadget that can serve as a Bluetooth speaker, connect you to websites like YouTube or LinkedIn, and more. 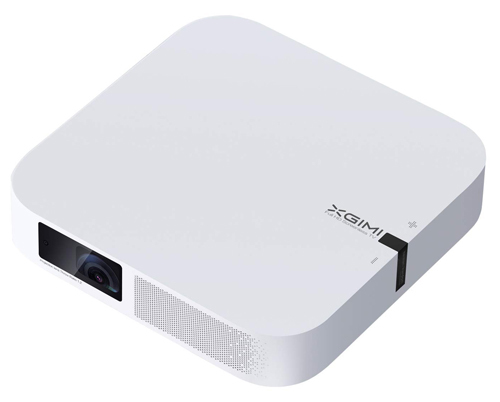 As one of a new wave of lifestyle projectors popular in Asia—it's a top-seller on the Chinese e-commerce site JD.com and also available online in the U.S—the Z6 is aimed at consumers more concerned with ease of use and convenience features than with enthusiast hallmarks such as precise color accuracy, contrast, and black levels. We review it here with that in mind. Along with its wireless connectivity, the Z6 includes an HDMI port (with ARC), a USB port, and a headphone output. Placement. The Z6 Polar offers front and rear projection options for both tabletop and ceiling mounting. When sitting on a table, the bottom of the image is at the same height as the centerline of the lens. Screen size. Based on our brightness measurements, the Z6's brightest mode can fill a 115-inch diagonal, 1.0 gain screen in a dark room or a 70-inch screen in a family room at night with the lights on. Using the lower power mode, which delivers far more neutral color, the image sizes drop to 100 inches in a dark room and 60 inches in moderate ambient light. Resolution and 4K UHD HDR support. The Z6's support for 4K UHD (3840 x 2160) and UHD with HDR works, but with significant limitations due to its lack of compliance with the current HDCP 2.2 copyright management protocol used for most 4K content. Investigation with a Murideo Six-G signal generator revealed that the projector will accept 2160p video at 30 Hz or 24 Hz (though not 60 Hz) with HDCP version 1.4 active, and display these at its native 1080p resolution after internal downscaling. It will accept the same signals with an HDR10 flag in the signal. But the image goes to black when HDCP 2.2 is activated, which is used to protect all UHD Blu-ray content as well as streamed UHD from the major internet services. Consequently, there is no way to gain any benefit from HDR encoding that might be present in today's UHD content. That said, in most cases when you attempt to connect the Z6 with a 4K signal beyond its capabilities, the source should automatically send a downscaled 1080p signal that will play fine on the native 1080p projector. For example, faced with the upconverted 4K signal from a UHD Blu-ray player playing a 1080p Blu-ray disc with older copyright protection, the projector negotiated a UHD connection and reported receiving a 2160p/24 Hz signal, which it downsampled internally to its native 1080p. Replacing the disc with a UHD Blu-ray resulted in the projector directly receiving a 1080p signal from the player for essentially the same result, but with no visible benefit from HDR encoding on the UHD disc. Brightness The Z6 offers two brightness settings labeled Highlight (the brightest) and Standard (the low brightness mode). Its five color modes include Bright, Standard (not to be confused with the Standard brightness setting), Work, Game, and the Soft and Gentle mode. In each brightness setting, the measured ANSI brightness was nearly identical for four of the five color modes, with the measurements revealing approximately 530 lumens in the Highlight mode or 380 lumens in the Standard brightness setting. Only the Soft and Gentle color mode was different, measuring about 10% lower brightness in both brightness settings. Brightest video mode for ambient light. The Highlight brightness mode adds a noticeable green bias in all color modes. It's little enough that some may be willing to use it for film and video when they need the extra brightness. Others will find it annoying, and will prefer using the Standard brightness mode and moving the projector closer to the screen to get a bright enough image in ambient light. Image Quality. The Z6's two brightness modes are unusual in having a significant effect on color. However, using either one, there is little difference in color from one color mode to the next. As noted above, all five color modes have a noticeable green bias in the high brightness mode. In the lower brightness Standard mode, all have acceptably neutral, realistic-looking color suitable for video and film. I preferred using the Standard brightness mode in all lighting conditions for video, film and presentations with photos. For presentations with graphics and text only, either brightness mode works well. The color modes differ primarily in their settings for contrast, saturation, and color temperature. All are oversharpened, which shows as ringing around thin lines in graphics and text and a grainy look in photorealistic images. For watching video and movies, and also presentations packed with photos, I picked the Bright mode, because it offers the best shadow detail, and turned down the sharpness setting to remove the graininess in photorealistic images and the ringing in graphics and text. Changing the setting to 0 gets rid of both issues, but also softens the image. You'll have to experiment a bit to find the setting you like best. Note that when you make changes to any predefined color mode, the changed version becomes the new User mode. For presentations that consist of just graphics and text, or even primarily of graphics and text with only a few photos, my choice for optimized presentation mode is Highlight brightness mode, using any of the four color modes with essentially equal brightness—Bright, Standard, Work, or Game—and with the sharpness adjusted to remove, or at least tone down, the ringing. Frame interpolation is on by default. It enhances the live look of video, but introduces an obvious digital video effect in movies even at the low setting. I turned it off for film-based content and on for video. Contrast, black level, and three-dimensionality are surprisingly good for a projector in this price range. With lights off, black looks suitably black, rather than dark gray; the projector gives up only a little shadow detail; and contrast is good enough for colors to look bright and nicely saturated. With lights on, you need a much smaller screen size to avoid the image looking washed out. In our tests, the focus was a little soft, a consequence of both the auto focus and powered manual focus being too coarse and skipping over the precisely correct focus setting. Even so, the best setting was not far off from sharp, and was the same across the entire image—as was brightness, with a measured brightness uniformity of 90%. 3D. The Z6 offers Full-3D playback as well as 2D-to-3D conversion. 3D isn't available if you're using 4-corner correction. And when it is available, you have to enable it every time you switch to 3D content, which some users may find annoying. It also failed to sync reliably with five different models of DLP-Link glasses I had on hand, usually working for up to a few minutes at a time, and then refusing to resync for just as long. XGIMI's online support responses insisted that any glasses would work, and user comments online suggest that others have gotten it to work reliably. But if you want to use 3D, be prepared that your existing glasses may not work as advertised. XGIMI sells its own glasses if needed. Rainbow artifacts. The Z6 does a good enough job of avoiding rainbow artifacts that anyone who isn't sensitive to them probably won't see any. If you see them easily, however, or don't know if you do, our standard advice is to buy from a source that allows easy returns, so you can test it out for yourself. Fan noise. Rated at less than 28 dB, the Z6's fan noise is the kind of steady, low frequency hum that you can hear in quiet moments in a small room, but will quickly fade into the background, especially in a room with ambient noise. There's no noticeable difference in fan noise between the two brightness modes, and no high altitude mode. Audio. The onboard Harman Kardon stereo audio delivers excellent audio quality for such a small projector and enough volume to fill a small room. Input lag. The measured input lag was 42 ms, which is fast enough for casual gaming. Serious gamers will want a lower lag time. Despite the glitches with 3D and with connecting to copyprotected 4K sources, , the XGIMI Z6 Polar is well worth considering. Its sleek white case will fit nicely into any decor, and its long list of features—from the Android operating system to WiFi and Bluetooth connectivity to light weight—makes it a solid choice for an equally long list of applications, from casual gaming projector, to small conference room projector, to budget home theater projector, to consumer electronics device for connecting to the Web. It obviously won't satisfy a serious enthusiast and isn't meant to replace more traditional and powerful projectors for home theater or gaming, not even the budget models found near its $500 price—most of which deliver far greater brightness. But when money is tight and features like compact form factor, portability, and wireless capabilities play a greater role than sheer firepower, the Z6 is a seriously impressive projector for the price.